I can't help noticing the wide selection of Hawaiian shirts in the men's departments these days. Wild, wacky, vivid colors that almost made me motion sick just looking at them. My husband is in love with Hawaiian shirts. In fact, we went to a party last week and all the men were wearing them. They are hot ticket items. At least with the older generation of males. Of course, not everybody can pull them off. Some guys are cool in them. Some guys aren't. How about you? Do you like them? That is so FUNNY! Every time I see that pic of Nick, I have a great laugh!! NO on the shirts! I like them, but like you said, you have to know how to wear them. On certain men, wore correctly - yes they look great. I mean, who could resist Magnum. I'm amazed at the styles from the 60s, 70s and 80s that are making their way back. Oooh, Tom Selleck in the morning! That makes my day. I love your illustrations of who should wear them and who shouldn't. My Dave looks very good in them but it definitely depends on the man. I think it depends on how many x's are on the shirt's size tag. A few flowers are good, a whole garden, not so much. Yes on Magnum, no on Nick! A Hawaiian shirt has a cameo in Absolutely, Positively (out in Feb!!) -- who knew I was on top of a trend! Though, LOL, it's in a consignment shop. 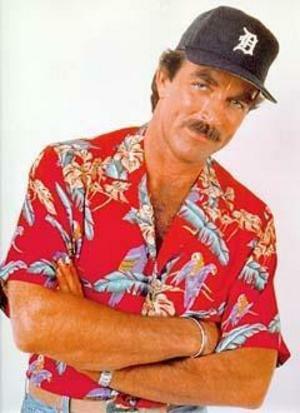 Well I think I like Tom Selleck in his,but I would need to see it in person to say for sure. Yes, I like seeing them on both men and women & would wear one myself. 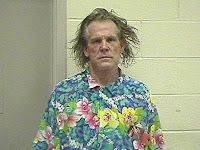 Well, I think only certain people can pull off wearing a Hawaiian shirt. Hawaiians, obviously. But men like my hubby cannot pull them off. You gotta have a certain look about you. Nick Nolte surely doesn't have the look. Magnum definitely has the look. Who wouldn't enjoy just staring at that picture all day? Anyway, I had a couple of my senior high school pictures taken in a Hawaiian print dress and they turned out wonderfully! It could have just been the photographer, but I gotta admit that it looked pretty good. All I can say is that I won't be purchasing a Hawaiian print shirt for my husband. He just isn't Magnum. These comments gave me a chuckle. Thanks for that! I have a growing collection of Hawaiian shirts and bowling shirts. Friday is Hawaiian shirt day at work and when I was active duty Air Force, those were our party shirts. My husband deserves a vacation and wears them often, but Magnum is the only guy who could get away with tucking them in! You gotta have a eighties moustache, be a private detective and live in Hawaii to pull it off. Magnum and "Fatman" McCabe knew how to do it.